Slap Me some Cakes at Slappy Cakes! There is always only going to be one outcome when kids are paired together with Make-your-own (MYO) kind of food - Great Fun, Full of Enthusiasm and Hearty Appetites all around! And Slappy Cakes is all that rolled into one. 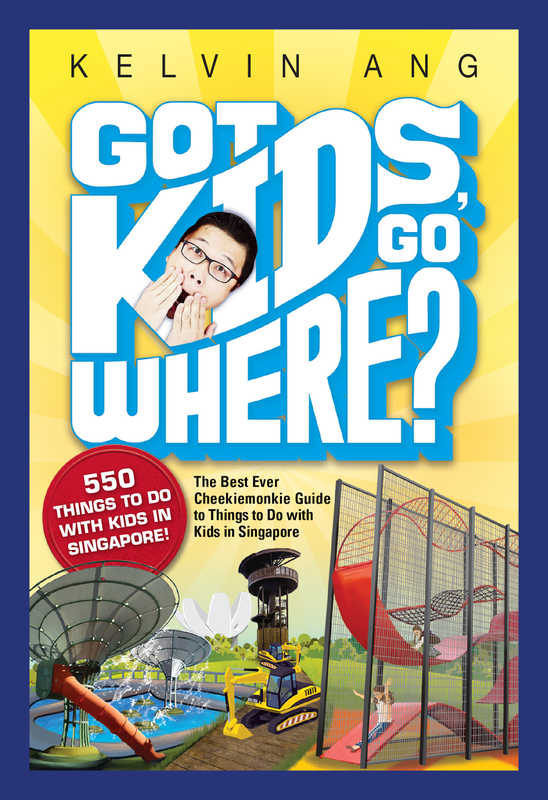 Originating from Portland, Oregon in the USA before expanding to Tokyo, Maui and the Philippines, the TungLok Group has brought Singapore's first Slappy Cakes outlet to The Grandstand (formerly Turf City). 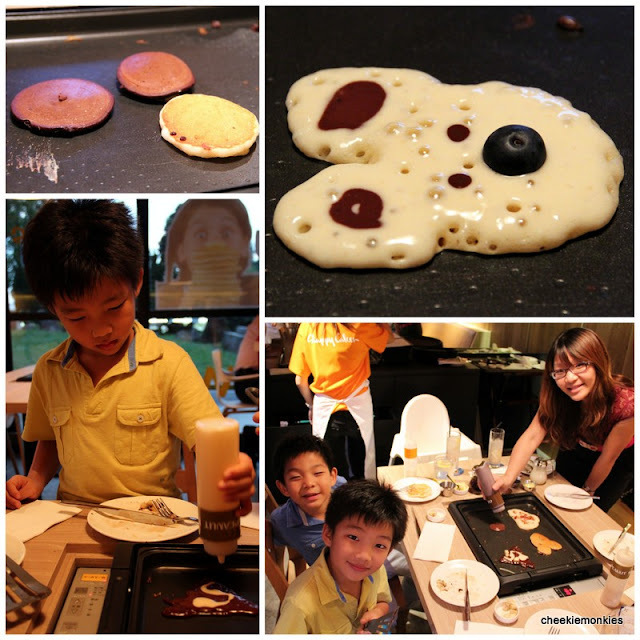 And briefly put, Slappy Cakes is where everyone in the family gets to create, design and just have loads of FUN with their very own MYO pancakes! We were invited to the official opening last Friday evening and undoubtedly, the boys couldn't wait to get into the thick of the action. So let us get started, shall we? Obviously, the first step in enjoying the Slappy Cakes experience is to choose one, or two (or all) from these selection of homemade pancake batters. We got to try all of the pancake batters and the Chocolate was a clear favourite with the three monkies and wifey. The Peanut Butter was good too, though I enjoyed the Zucchini batter the most. I know, it actually tastes better than it sounds. Each bottle of Slappy Cakes' pancake batter is good for 2 to 3 persons, which I reckon can approximately make up to 7 regular-sized pancakes. Make-Your-Own pancakes can only be as fun if there are additional stuff to throw in while the batter is simmering on the hot griddle. And there were definitely lots of fixings - both sweet and savory - for us to take our pick from! The kids adored having banana and chocolate chips in their pancakes, while I discovered the most delicious (and decadent) combination has got to be chocolate chips AND bacon tossed together with Buttermilk pancake batter. You can't tell from the photo below but the boys were getting rather impatient with me for taking far too many photos! The final icing on the (pan)cakes was indisputably the toppings and once again, we had choices to make. Anything sweet will do for the monkies and the maple syrup was enough to keep their sweet tooth satisfied. For the wifey and me though, the lemon curd - a sweet syrup with a hint of coconut - worked wonders for our pancakes. Step 4: Enjoy your own pancakes! Uhm, I guess this is pretty much self-explanatory. Squirt, slap and paint the griddle with whatever batter you fancy and then splatter it with your choice of fixings and toppings, before eating it all up like a messed up kid. Who says food can't be fun? 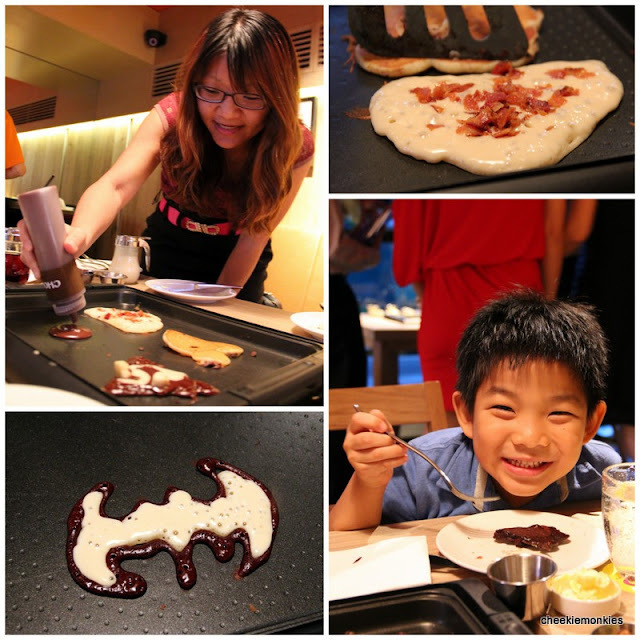 As with all other kids-friendly restaurants that we have been to, Slappy Cakes is one of those places where the experience of making something yourself will definitely be enjoyed not only by kids, but also by the kids-at-heart. And best part is the kids can never complain about the food - because they made it themselves! Muahahaha. Not that they had any trouble in polishing off all the pancakes on their plates. So fun! So cute! So cool! Yup, definitely cute and fun... and the best part is the mess is made outside of home! Haha. Individual preference I guess. The wifey didn't like it... so I'm the weirdo. Haha. Which is better nook or slappy pancakes? Both are pretty much the same actually. But if you want more food options other than pancakes, then Nook will be better as it serves all-day breakfast.